ICE has offered me to test one of their new trikes for my Himalayan adventure. After some long thinking and hesitations, I eventually made up my mind on the Adventure with front suspension and a few upgrades (see below). I received it last week and set it up during the weekend. It looks absolutely beautiful. The construction quality looks outstanding and so does the paint and very nicely finished welds. - folding : almost everything's already been said about this masterpiece of engineering. 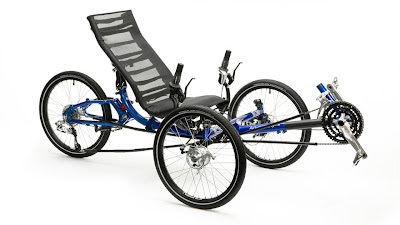 I will just add that it's really cool, and will be useful to pack the trike for transport. - front suspension : will smooth out bumps and holes, making a very comfortable and worry free ride. - parking brake : I used a strap to block the front wheel on the QNT, the parking brake will be more practical. Also it can be used a drag brake on long steep descents. The trike was pre-assembled so I didn't have much to do, it took less than 2 hours before it was ready for riding. First impression are very positive. The Adventure feels very comfortable. It is much higher than the QNT, which is one of the reasons why I chose it over the Sprint, but significantly shorter. I feel less vulnerable on the road in this position (esp regarding dog encounters…). I haven't ridden it at high speeds yet to see how stable it is. I have the feeling the rear frame is stiffer than on the QNT, and I am actually riding significantly faster than with the QNT (maybe it also has to do with the higher riding position? Or the fact that the elastomere is new?). I will write a longer review when time exam is over.